This is the perfect sauce to start off any meal, whether you make this in a covered sandwich, over pasta, rice or even over a baked potato. No matter what you can really just eat this right out of the dish then spoon it the bowl sopping up the sauce with a wonderful bakery favorite bread. 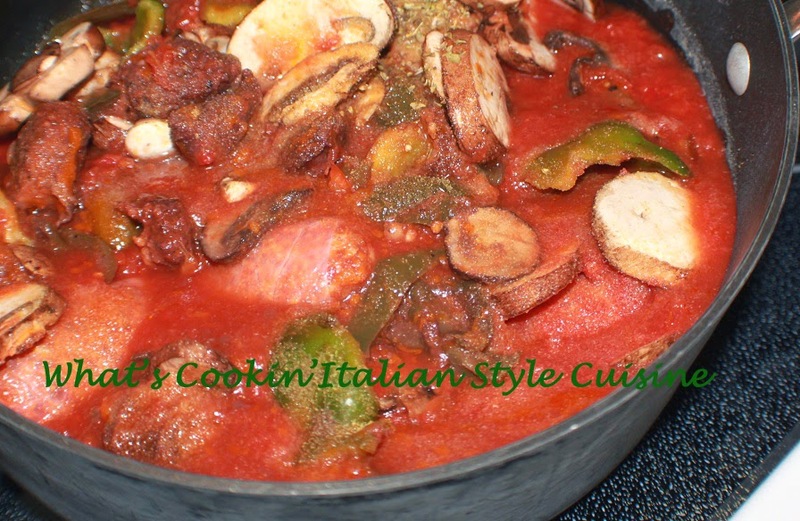 Either way you will be very please on this wonderful blend of flavors if your a Italian sausage lover. I love this tossed over penne pasta or rigatoni. My son loves it in a sub roll baked with garlic bread and topped with mozzarella on top. Rice and potato lovers you're also in for a treat! Great over cooked pasta or choice of rice, mashed potatoes or serve in a covered sandwich. Serving suggestions: Cooked pasta to package instructions, cooked rice to package instructions, sub or hard rolls adding melted cheese. Cooked potatoes. In a large saucepan 5 quart, saute the sausage in 3 tablespoon olive oil until browned on both sides around 10 minutes. Add the garlic, peppers and mushrooms. Saute for around 2 to 3 minutes. Add the tomatoes, wine and simmer on low for around 1 1/2 hours, adding water if needed. .